Faith and Theology: Glad to see the back of him? Glad to see the back of him? Of course, one has tried all the textual manipulation, and special pleading, to avoid the thrust of the story, to dodge the bullet, to deflect it from having anything to with me – or you. For example, turning the rich guy into a very rich guy, like Bill Gates or Richard Branson, J. K. Rowling or Adele, people out of our financial league. Maybe the filthy rich will have a hard time getting into the kingdom, but not me – not us. But that doesn’t work, does it? Because compared to people who live in Third World rubbish dumps or even UK sink estates, compared to the homeless and the hungry, we might just as well be Gates or Branson, Rowling or Adele. Another for-example: we say it’s not the man’s money and possessions as such that are the problem, it’s his attitude towards them – he’s got an “attitude problem”. He wasn’t in control of his wealth, his wealth was in control of him. Or we suggest that surely he abused his wealth – we might speculate about his voracious or “conspicuous” consumption. We, however, have our finances under control – savings, standing orders, direct debits – “all things in moderation” is our economic catchphrase. But, er, where in the text does it say that the rich guy was out of control, or that he was a spendthrift? On the contrary, doesn’t the text explicitly state that he’s obeyed all the commandments all his life? Which entails, in fact, that he was diligent in charitable giving, because the provision of alms was a fundamental religious obligation for a pious Israelite. Indeed, Jesus has snuck in a “Do not” that isn’t actually in the Ten Commandments – “do not cheat”, “do not defraud” – and the rich guy says has obeyed that one too. He’s not a tax-evader. So why assume that the rich guy was greedy or gaudy? And why do we presume that as long as we’re not, as long as we’re modest and generous, there can’t be a problem? It’s amazing, isn’t it, the way you can avoid seeing something that’s right in your face. The way you can read, hear the story of the rich guy again and again and not see the connection. The connection, I mean, between the cash and the commandments. Because it’s right there in the text. Some Christians do, of course, see a connection, but, alas, it’s the wrong one. Prosperity Gospel Christians who claim it’s precisely when you keep the commandments that you get rich, and that being rich is a sign that you’ve kept the commandments – and, of course, that you’re “saved”. But Jesus says just the opposite! He says that if you keep the commandments and get rich, so what? – it’s got nothing to do with salvation. Indeed being rich – and being rich as such – makes it harder, not easier, to enter the kingdom. With consummate sarcasm Jesus says you might just as well be a great lump of a camel, which was the Porsche of the rich in Judea, trying to squeeze, hump and all, through the eye of a needle. And yet even this startling image has suffered egregious self-serving spin “at the hands of bourgeois conscience-tranquilizing” interpreters (José Miranda), with the claim (going back to the Middle Ages) that the “eye of the needle” refers to a certain small gate in ancient Jerusalem through which camels could only enter on their knees! Let’s talk cat, not camel: C-A-T – Close Attention to the Text. Here in Mark 10:17ff. 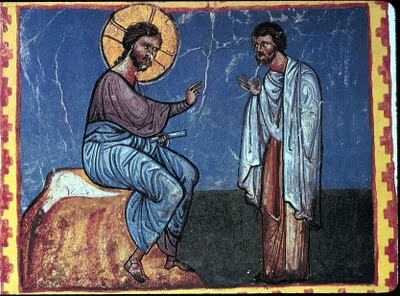 Jesus encounters a man who is not a hostile or defensive questioner like the Pharisees at the beginning of chapter 10. No, the question the rich guy asks Jesus is a genuine one about how to order your life in a morally integrated way. He wants to honour God and treat fellow human beings with dignity and respect. He begins with a courteous salutation – “Good Rabbi” he calls Jesus – while Jesus replies modestly with a well-known proverb, “No one is good except God alone”. The stage is set for an honest and constructive conversation, no hidden agenda, no point-scoring. Then Jesus draws the man’s attention to the commandments that come from the so-called Second Table of the Law, dealing with our behaviour towards our neighbours. Interesting that. People ask what they have to do to be “saved” and they get a lecture about believing X, Y, and Z, or being “born again”, or getting “baptised in the Spirit”. But Jesus says nothing about these things, nothing, in fact, about God at all. As I say, interesting. Then, yes, the rich guy says he’s kept all these commandments – including that extra one – and observe that Jesus doesn’t contradict him, he takes him at his word. But then Jesus adds, “Oh, I forgot one thing, a small point: sell everything you own and give the proceeds to the poor.” Which sounds extreme enough to us, but in first-century Palestine it’s extremer still, even inhumane, because it meant parting with your property, your land – and you know how important land is to the Jewish people. And that this is precisely what Jesus means is confirmed when he shortly refers to would-be disciples leaving their land. So make no mistake: Jesus is demanding a sacrifice beyond measure. Is it any wonder that the rich guy can’t make it? But Jesus still hasn’t delivered the knock-out punch. That comes after the rich guy has walked away, and Jesus discusses what’s just happened with his disciples. For there we see, unmistakably, that it’s not only those with loads o’ money who are rich, it’s anyone with any money who is rich. The disciples’ question “Then who can be saved?”, and Jesus’ reply “Humanly speaking, no one”, make this absolutely clear. Whether you own a new Porsche or an old Punto, no chance. But look – there is nothing personal here. Again, there is no suggestion that you and I are personally unjust, avaricious, or irresponsible. The point is systemic: that is, it is simply the case that people with money, and nations like the US and UK, live in and off an unjust system – a deliberately fixed and intrinsically biased market – which ensures that poor people and nations in the South remain poor. As the American theologian Stanley Hauerwas starkly puts it: “The truth of the matter is that all wealth is the result of murder.” The colour of money looks green, but in fact it is claret. So then, is this one of those sermons that simply leaves everyone feeling guilty? Absolutely not. There is good news here. First, because there is truth here. Avoiding reality, living in denial, looking for alibis may make us feel more comfortable, even righteous, but it won’t set us free. Only the truth will set us free. Even when painful, the truth is always good news. Second, though keeping the commandments will not save us, it is better to keep them than to break them – it is better to be generous than selfish. For then we can be sure that there is at least a little bit of God in us, for God is generous, not selfish. And then who knows what may happen, for didn’t Jesus say that, yes, on our own, no chance of salvation, but with God – with God there is every chance? And a final thought: there is only one time in the whole of the gospel of Mark where Jesus is said to love someone – and it is here, it is this rich guy: “Jesus looked straight at him with love” (Mark 10:21). Jesus loves rich people! Whew, is that good news, or what! For a moment there … God certainly has a bias for the poor, because the poor are always getting screwed, and because the rich can – and do – look after themselves – thank you very much – but God loves the rich just as much as he loves the poor. And, yes, love can work wonders. Indeed, I wonder whether we should automatically assume, as we do, that the rich man rejected Jesus’ call, for he walks away with a heavy heart, grieving, not scoffing, and it is precisely such distress, when one feels disorientated, that marks the start of personal transformation. In fact, early church tradition has it that that rich guy was named Barnabas, a cousin of the evangelist Mark, one of the earliest church leaders in Jerusalem, and the disciple who first introduced Paul to the apostles, and who became a companion of Paul on his missionary journeys. Which makes me rethink my opening gambit about the rich guy: perhaps I’m not glad to see the back of him at all. In fact, I may even be beginning to like him.